The first week of December was the post-climax to the heavy fighting and costly gains of November. The Regiment, with centers of resistance in Langerwehe and Jüngersdorf, held a commanding position overlooking the Cologne Plain to the north. Our observation of enemy-held territory extended as far to the east as Düren, and Merken to the northeast. It was vital to the success of future offensive operations that this ground be held at all costs. It also fell to our lot to clear small pockets of enemy dug in close to our positions in order to secure a line of departure for an expected continuation of the drive to the east. On the first day of the month the 1st Battalion completed its relief of the 3rd Battalion, 26th Infantry, in the vicinity of Jüngersdorf, The 2nd Battalion remained in position is the eastern part of Langerwehe while the 3rd Battalion reorganized its companies and maintained a reserve position in the western part of the same town. The Regiment was alerted for an attack toward Düren, involving the seizure of the stepping-stone villages of Obergeich, Geich, and Echtz. The 3rd Battalion was notified to prepare itself for an assault on the first two towns, in conjunction with a push of a task force from the 3rd Armored Division. The 2nd Battalion was ordered to establish an outpost line of resistance several hundred yards to the east of the town, which would, in effect, serve as a security force for the line of departure of the attacking troops. This was accomplished in all cases except one, the reinforced enemy strong point at Stutgerhof - a farming villa 1,000 yards northeast of Langerwehe. Patrols up to platoon strength engaged the enemy in heavy close-in fighting at this point for several days and nights running. Eventually the Germans did withdraw under pressure, but they maintained such rigid surveillance on the spot that it was untenable for our troops to occupy. In the meantime, the Battalion Commander had employed his tanks to flush out a number of small enemy strong points in houses along the Langerwehe - Obergeich road. The 1st Battalion, probing north from Jüngersdorf, drove the enemy from positions in the rail bed of the Aachen-Cologne Railroad. At the same time enemy patrols, attempting to feel out the flanks of the battalion, were driven back towards their own lines. On the 4th orders were received completely changing our plans. The forthcoming attack was cancelled and plans arranged for a relief of the 18th Infantry by elements of the 9th Infantry Division. The 16th lnfantry was to be relieved before our regiment; and the plans called for our 3rd Battalion to relieve the 1st Battalion, 16th Infantry in Luchem, a small town on the Cologne Plain north of Langerwehe. This was accomplished prior to midnight on the 4th. On the following might the 1st Battalion was relieved by the 2nd Battalion of the 39th Infantry and moved the next morning by motors to the village of Hombourg, inside the Belgium border, southwest of Aachen. The afternoon and evening of December 7th saw the 2nd Battalion relieved by the 2nd Battalion, 60th Infantry and the next day move to Remersdaal, Belgium. On the same night the 3rd Battalion was relieved by the 2nd Battalion of the 47th Infantry and moved to Gemmenich, Belgium, The morning of December 8 found the Regimental Command Post moving to Plombières, Belgium, a village centrally located among the three battalions and other regimental installations. The 18th Infantry was back for a rest after its most bloody battle and extended period of action since August 24th, when the great blitz across northern France took place. of Belgium is dotted with small villages, sweeping hills and valleys, beautiful orchards and pasture lands, winter was about to set in and the air was fresh and cold. Consequently, through the cheerful cooperation of the Belgium people, all our troops were billeted indoors — in most cases the private houses of the good citizens. The regiment was to be in this rest area for an indefinite period and a program of rest and rehabilitation was drawn up for the troop's. Every man was given a bath and new clothing was issued. Company parties, U.S.O. shows, movie programs, American Red Gross Club mobiles, and recreational trips to Paris and Verviers were all made available to the troops. A training period was instituted to develop team work among the vast amount of replacements that had been absorbed into the regiment during the stormy battle days of November. The firing of small arms and crew served weapons was an integral part of this period. various points in the heavy woods that extended for several miles south of Eupen and it fell to our lot to comb these woods and destroy the enemy there. At 2400 hours of the 17th, orders were received to discharge a task force to the vicinity of VK-8116, a portion of the woods where the paratroopers were reported to have cut the Eupen - Malmedy road with harassing automatic fire. The plan called for our "L" Company reinforced to move south to the hostile area at 0730 on the following morning. At the same time a reinforced platoon of the 16th Infantry was to move north to the same area, and the two groups were to converge on the enemy. The operation went off as planned the next day, and "L" Company accomplished its mission with a minimum amount of contact with the enemy. Either the paratroop force had been overestimated as to numbers or had shifted its center of operations. Only a few small groups of the enemy were encountered and the majority fled into the woods on our approach. Four were taken prisoner and they proved to be from a Battle Group Von der Heydte. Before nightfall "K" Company was moved to the south to take up a blocking mission along with "L" Company in the woods astride the road. In the meantime, V Corps Headquarters had become concerned about an enemy build-up east of Monschau and alerted us to have our 1st Battalion prepared to move to the east to reinforce the 47th Combat Team in that section. The situation was changing rapidly, however, and at 1400 hours the regiment was alerted to move to the Weismes area where the enemy was threatening with a display of tanks. By nightfall of the 18th the Regimental Commander had received so many warning orders owing to the uncertainty as to the enemy's next move in his offensive, that we were prepared for any task the next day might bring. At 0800 hours on December 19th the situation clarified considerably when CCA of the 3rd Armored Division was ordered to effect an immediate relief of the 18th Combat Team in its defensive role around Eupen. Our regiment was ordered to conduct a large-scale sweep of the entire wooded area south of Eupen and then to rejoin the 1st Division, committed farther to the south. The relief was completed at 1300 and the regiment jumped off immediately on its mission. Spasmodic resistance was encountered but all battalions reached their objectives without any difficulty by nightfall. Twelve prisoners of war were seized and considerable enemy equipment discovered and destroyed in the woods. "K" Company held up to contain that was reported to be a formidable force in one portion of the woods; but when the next morning rolled around, the enemy had fled, leaving behind 23 American Soldiers to be rescued by our men. At 0720 hours on the 20th the regiment was alerted to move to an assembly area in the vicinity of Sourbrodt, there to be employed as Division Reserve until further order. Shortly afterwards the Regimental Commander was ordered to dispatch the 2nd Battalion to the sector of the 26th Combat Team, under whose control they would operate. The regiment completed its move to Sourbrodt by 1635 hours; and the 2nd Battalion, owing to very heavy pressure throughout the 26th Infantry sector, was committed on a broad frontage, reinforcing both the 1st and 2nd Battalions of our sister regiment. That evening "I" Company moved to a dam south of Sourbrodt, to guard it against sabotage. On the morning of December 22nd word was received that some of the positions of the 26th Combat Team had been overrun by enemy tanks and infantry south of the town of Bütgenbach. At 0955 our 1st Battalion was alerted to move to that vicinity by trucks and counter-attack in a southeasterly direction to restore the position. After several changes in plans the situation for the 26th Infantry appeared more favorable; and the 1st Battalion moved to Bütgenbach that afternoon to effect a relief of the 1st Battalion, 26th lnfantry, rather than counter-attack. This was completed by 1000 hours on the next morning; the 2nd Battalion was regrouped and organized the entire sector southwest of Bütgenbach; and the 18th Combat Team now assumed control of the entire area south of the town. The Regimental Command post moved to Nidrum, a small village north of Bütgenbach on the evening of December 22nd. The next day the 3rd Battalion moved to take up a reserve position in the northern outskirts of Nidrum, while the two front line battalions patrolled actively to the south and made contact with scattered enemy groups guarding the northern approaches to the Bütgenbacher Heck, a vast wooded area running parallel to the new Division front. The supply trains of the Combat Teams moved to Camp Elsenborn, north of Nidrum. The 3rd Battalion Commander reconnoitered the various defensive zones of the Division sector with a view of counterattacking or reinforcing any part of the sector on Division order. and string barbed wire. At the same time our reconnaissance and combat patrols were very active carrying the fight to the enemy's lines. These actions were small but bitter. In reality, the Bütgenbach sector, because of the reluctance of the enemy to offer active combat, became a deadly training ground for our high percentage of new men. Individuals acquitted themselves splendidly, and a new team spirit was seen developing. The temperature dropped; the North wind blew fiercely; snow storms covered our positions with a white blanket — Winter had come to the 18th Infantry on the Western Front. Squad and platoon shelters were constructed underground at night out of hewn timber, and stoves were installed in them. In spite of the physical hardships of a winter campaign, the morale and physical condition of the troops were higher and better than they had been in sometime. Thus the year ended with the regiment dug in on a barren, snow-covered front in eastern Belgium. 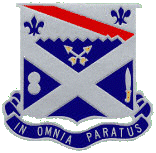 1944 had seen the 18th Infantry rise to glorious heights on many a bloody battlefield. What the new year would bring only time would tell; however, if spirit and determination were any criteria, our regiment was ready to do even greater deeds in contributing to the foe's downfall in 1945.